Three years ago I noticed some catastrophic geology, consisting of thousands of cubic miles of blast melted rock forms in north central Mexico, that, for numerous reasons, could not be confidently explained by volcanism. In what sparse literature you can find about them, they are referred to as the ‘Chihuahuan Ignimbrites’. The geology maps described the materials that had gotten my attention as volcanic tuff, or ‘ignimbrite’ (the word is from the Latin for ‘Fire Cloud Rock’). But in the same way you can visually recognize which way the materials in a flow of spilled paint, mud, or lava, moved while they were liquid, even after they have come to rest, and solidified. 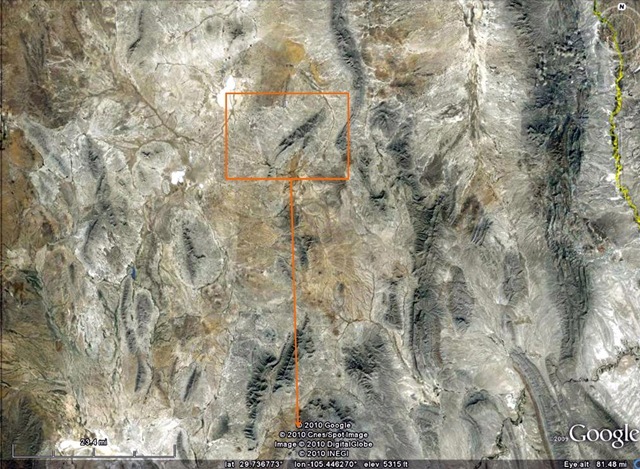 In good satellite imagery, the emplacement motions of those rivers of melted stone in central Mexico can be easily read. And It’s when you begin to study the directionality of the fluid emplacement motions of those pyroclastic materials that you run into a mystery. At this altitude you can’t easily determine the condition, or the actual patterns of movement, and flow, in the impact melt. The standard model of the emplacement of volcanic tuff assumes gravity as the motive force while it is in motion. It also assumes that a volcanic vent, and an explosive eruption, as the source of the material. Have you ever seen films of a very big explosive eruption like Mount Pinatubo, or Mount St. Helens? After the ash column collapses the particles, and fragments of rock remain suspended in a superheated cloud that behaves like a fast flowing liquid. And it flows down the slopes of the volcano; sometimes at hundreds of miles per hour. When that fiery cloud of ash, and rock, comes to rest, and solidifies, you get ‘Tuff’, or ‘Fire Cloud Rock. In the field of fluid mechanics, a flow like that is called a fluid density current. A fundamental characteristic of the formation, and emplacement of a fluid density current, is violent, explosive motion. And when you zoom in close anywhere in that area, and you study the perfectly pristine ejecta, breccias, and rivers of flash melted stone, the easily discernable patterns of emplacement motion are all consistent with very quick motion like ejecta in an impact event. The landforms rising among the pristine rivers of melted stone weren’t heavily eroded for millions of years. They were heavily ablated a few thousand years ago in a giant, multiple fragment, thermal airburst, event that lasted just a few seconds. The materials described here, and on the page I’ve labeled A Thermal Airburst Impact Structure are the pristine product of that ablation. All material motion across the surface of the Earth requires a motive force. And in the case of emplacement of a density current of flash melted stone, there are only two forces to consider; gravity and/or pressure. Each produces its own characteristic patterns of movement, and flow. Gravity only works as a motive force if there is a slope to flow down. 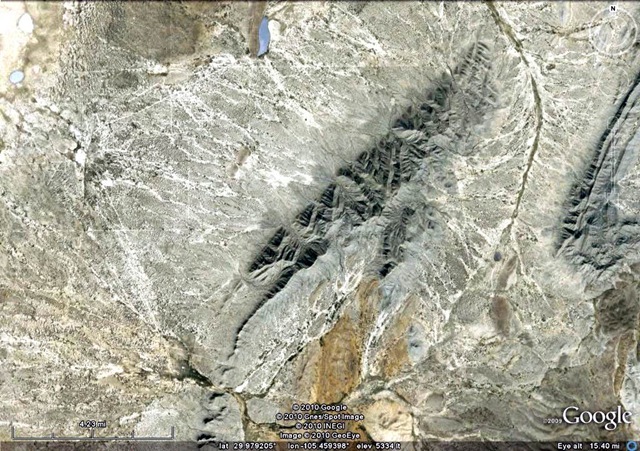 The motive force for the melt, and pyroclastic rock in north central Mexico wasn’t gravity pulling it down-slope, away from a vent into low lying areas. The motive force was atmospheric pressure, pushing the material from behind, into areas of lower pressure. Like the debris laden froth, and foam on a storm tossed beach. The sources for the ‘ignimbrites’ are simply the bare, ablated, areas behind the flows where there no melt. Look closely, those are wind-driven patterns of movement, and flow. It’s not “ignimbrite” at all. It’s all wind-driven, geo-ablative, airburst melt. The pristine rivers of airburst melt in context with the landforms they were ablated from become a standard candle, so to speak. Different catastrophic events have different examples of a ‘new terrain’. 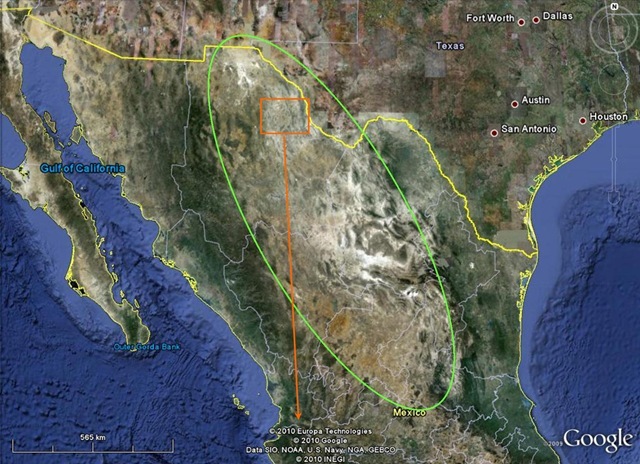 And north central Mexico is a perfect example of a geologically young, thermal atmospheric, geo-ablative terrain. The arid environment has preserved it in extraordinary detail. And when you look around the rest of world, you’ll realize that ablative landforms such as those are frighteningly common. It is only here that we find the blast effected materials in such perfect condition. And in context with their ablative sources. Every where else in the world we find such ablative orogenies, the airburst melt has decomposed to soils, or they’ve become overgrown with vegetation. or both. The Rosetta Stone provided scholars with a cipher key that allowed them to finally read actual eye witness accounts of history that had only been speculation before. And the emplacement motions of the rivers of airburst melt in the Mexican Impact Zone are a ‘Rosetta Stone’ for understanding the true geo-history of the world. And it isn’t anywhere near as uniform, and gradual, as has been assumed in the past.